First of all, to anyone who has requested this, good for you! If you’re wanting to remember how to do these rolls and stretches on your own, you’ve already jumped one of the toughest hurdles on the way to improving your flexibility and, in turn, your mobility. You’re starting to feel the benefit enough to want to work it into your daily routine. Congratulations! You’ve bought in! But it can be confusing, since most of the things I recommend are to stretch or massage opposing muscle groups, and they’re similar in positioning. Here is my illustrated short list of proven areas to roll, how to position your body on the roller to do so, and my favorite hard to cheat static stretches. These are by no means a comprehensive list; these are the exercises I’ve found over time to be the most efficient for the time spent, and that in my experience give you the greatest benefit for the time and effort spent. Nothing is required for any of these but a roller, foam or otherwise, and your motivation to improve. FOAM ROLLER The direct pressure of rolling across tight tissue to break things up, followed by static stretching with deep breathing, works very well and is a good efficient use of time. These exercises are in the order I prefer to do them, and the order I usually go with in my classes; this is not in any way set in stone, and I highly recommend experimenting with the order. 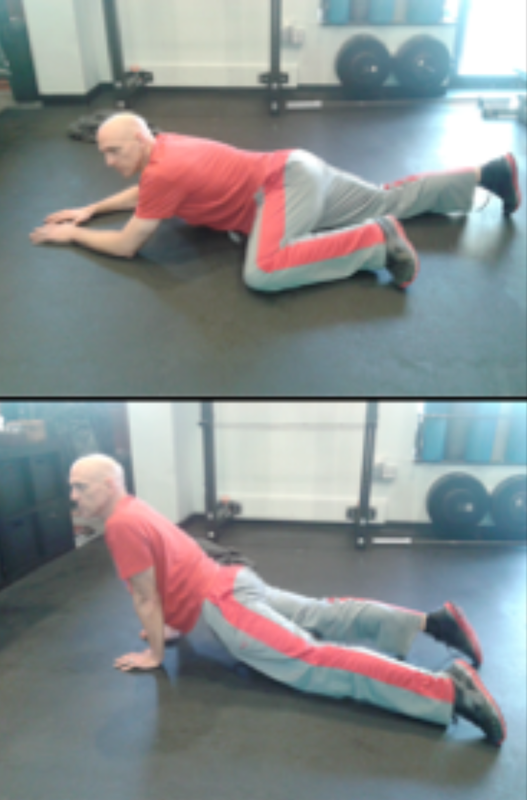 If you find that rolling your glutes before rolling your back works for you, go for it! It’s easy to foam roll in a less than optimal way, but it’s very difficult to roll yourself in an injurious way as long as you stay out of your lower back and away from any bony areas if you’re using a hard roller. Always try your best to breathe normally, if not more deeply than normal, when rolling. Holding your breath creates tension, and tension fights the beneficial effect of the roller. It’s tough….but relax. Upper Back/Scapulae *Place the roller behind you on the floor, seated in front of it, knees bent *Lie back on the roller, with it just below your neck, at the top of your shoulder blades *Press down with your heels, raising your hips off the floor *Push up with your heels toward your head, rolling the roller down your back to the bottom of your shoulder blades. STOP THERE! Don’t roll down into the lumbar curve, or the bottom curve of the natural “S” shape of the spine. Return to the top of the shoulder blades. *Repeat. I recommend 10 to 15 good rolls top to bottom. Shifting side to side to focus on each shoulder blade is encouraged as well. Sit directly on top of the roller. Place both hands on the floor behind you. They will be stationary. Pull one foot up next to the roller, close to you, knee bent about 90 degrees. This will be your stationary foot. Pivoting off of your stationary foot and your hands, roll up and down on the roller from the top of the glute (where you can feel the bony crest of your pelvis in the back) down to where you feel your glute meet your hamstring. Work one side at a time, rolling up and down and gradually working your way from your midline to the outside of your hip. Repeat 15X on each side, or as long as necessary. This area is sensitive. It will probably be uncomfortable, but you’re a champion. Place the roller on the floor, and position yourself with one hip joint directly on top of the roller with the leg fully extended. The torso will be perpendicular (sideways) to the floor, similar to a side plank. Place your hands on the floor on the side of the roller nearest your head. This will be stationary. Place the opposite foot flat on the floor IN FRONT of the extended leg, knee bent about 90 degrees. This foot will be stationary. Pivoting off of your stationary hands and foot, pull your body up and down to roll the outside of the leg, from the hip joint to just above the knee joint. Try to bear down with as much pressure as you can stand, and try to relax the roller gradually, work it’s way deeper. You may have to play with the positioning of your hands and foot; it’s important to try to cover the entire length of the thigh with each roll. Place the roller on the floor, and position yourself over the roller, facing down to the floor. Set the roller right in the crease of one hip, with the other leg completely off of the roller and knee bent so that it is even with the end of the roller. This foot will stay stationary. Using your hands and your stationary foot, roll the front of your thigh up and down the roller, from the bent crease of your hip to just above the knee, avoiding the patella. Repeat 15X on each leg or as long as necessary. I can’t stress enough the importance of breathing when doing these exercises, but I’ll try. It just does not work the way it should if you fight the stretch by holding your breath or taking short, labored breaths. Breathe as deeply as you possibly can, and let the breathing actually do some, if not most, of the stretching for you. The expansion and collapse of your chest and abdominal cavity move more muscle around and subsequently relax more tissue, freeing up more than one muscle, muscle group, or movement at a time. It just works better. This is a two part stretch, and can be done as a walking stretch, stepping into each stretch and alternating legs, or stationary for repetitions. Begin in a tall half kneeling position, with both knees bent about 90 degrees. The front foot side will be the side being stretched. Take the elbow, on the same side as the front foot, inside the front leg and down toward the floor, as close to the front heel as you can get. In this stretched position, take 1 to 3 deep breaths, relaxing deeper into the stretch with each breath. Relax. Without moving the feet, place both hands directly beside the front foot, one on either side, fingertips on the floor. Without moving the feet, raise up on the back foot and try to straighten the front leg, stretching through the hamstring. Hands should remain on the floor, dropping the head down toward the knee. Hold this stretched position for 1 to 3 deep breaths. Relax. Begin lying on the floor, neck supported and neutral. Prop your head up with your roller or a rolled up towel or small pillow, so you can relax your neck and not create tension from holding up your head. Roll over onto one side. Relax the arm on the floor. Bend the top leg at the knee about 90 degrees, and roll down to the floor until your knee touches. Reach over with the hand on the floor and hold that knee down to the floor. Your bottom hand will be holding your top knee. Reach back with your top hand and grab the top of that foot, holding firmly. Your top hand will be holding your bottom foot. This is easily confused with the Bretzel, but they do completely opposite things. This stretch will directly reverse the leg positioning. This is a great quad and hip stretch that is nearly impossible to cheat. Begin seated on the floor, with one leg tucked back like a hurdle stretch. Hold that ankle tightly with the hand on that side. Bend the other knee about 90 degrees, keeping it on the floor, and pulling it up even with the hip. Grasp the thigh behind the knee with the hand on that side, holding tightly. Keep a tight grip on the ankle and knee, and roll back until both shoulders and the leg you are holding by the knee are flat on the floor. The opposite knee will roll up off of the floor. Holding this position, simply squeeze and contract the glute on the side with the raised knee as fully as possible. 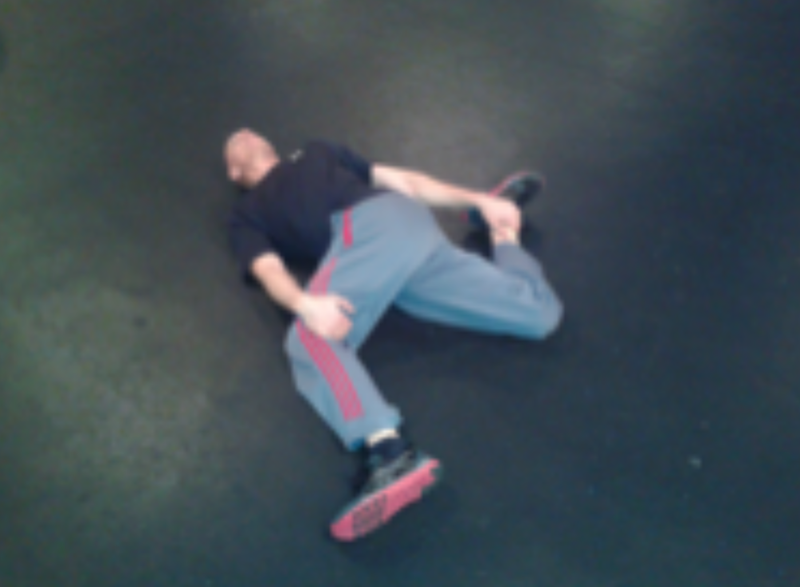 This will create a fairly intense stretch from the hip flexors down the thigh toward the knee. Take 5 to 10 extremely deep breaths. As you relax, your knee will fall closer to the floor. Let this happen naturally through the relaxation of breathing rather than trying to actively press the knee down. Repeat every day!